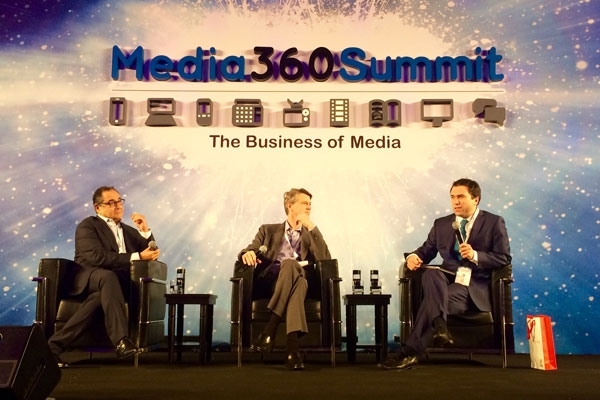 HONG KONG — Media360Summit, the region's top event for leaders of the media industry, got off to a rousing start Thursday with a punchy dialogue between US and UK industry leaders: Michael Kassan, CEO of Medialink, and Mike Cooper, worldwide CEO of PHD, about the extreme changes they've witnessed over the course of their careers. Organised by Campaign Asia-Pacific, the closed-door, invite-only Media360 Summit at Hong Kong's Ritz Carlton sees the congregation of around 300 decision-makers comprising brand marketers, consultants and leading global media and agency executives. To start the first keynote session, moderator Ros Atkins, BBC presenter, asked Cooper and Kassan about the key adaptation they made over the past five years that had been the most effective in dealing with the changes in the industry. "Went and got a degree in therapy," Kassan immediately quipped. "There's a lot of therapy involved in getting all sides to regain trust, which at the end of the day, is an important aspect of this business. With chaos comes opportunity, and that's hard to recognise if there is a lack of trust." Cooper replied that it would be much more efficient to talk about what hasn't changed. "I met with a really big global client the other day who said to me, 'I can't think of any other industry that has changed more than yours.' "
"Do you think then that it's the role of the media agencies today to rebuild trust in the industry?" asked Atkins. Kassan replied, "When Mike and I first started, we were convincing people that media agencies need to exist. In a sense we're coming all the way back to that." "We are in so many areas today," Cooper said. "Content marketing, sports marketing, data, analytics, mobile ... We have had no choice but to acquire specialist skillsets in those areas. This is where the trust comes in. Clients are incredibly busy running their businesses and don't have the time to know everything. So they do rely on their agencies for that kind of expertise. "Two areas of strength I would look for in an agency, if I was a client, are strategic planning and people who are creative technologists." Some people might argue that media agencies aren't communicating clearly with clients about the importance and impact of media, Atkins suggested. "I honestly believe that they [the agencies] do," countered Cooper. "Unilever launched a new planning process which puts media at the start of the process. It's a recognition of how much more important media is today. I've worked in media for over 30 years, and we used to just have 10 minutes with the client before lunch. If the client was hungry, you'd get spat out." Putting things into "Mad Men" terms, Kassan joked that Don Draper used to get all the girls while the media guy would be sitting in the backroom with a bowtie and an abacus. "Truly media is at the center now, but let's go back to the role of the media agency and the dreaded 'P' word: programmatic. What's to stop a client from asking, 'If my very smart machine can speak to your machine, what the hell do we need from for?' " asked Kassan, pointing at Cooper. "Well, with the speed the business is running at, you need a great deal of emphasis on communications planning," Cooper retorted. "The more complicated it gets, the more the need for consultancy grows. It doesn't diminish the role of what we do." What programmatic has allowed agencies to shine a light on, capitulated Kassan, is that which is not commoditized, and that is strategy. "Size matters, but it matters less if it links to strategy," he said. Planning in the traditional sense is dead, Cooper continued. "We're marketing strategists. There's so much data, so much info. We work in a dynamic industry where every week there's a new development." "But, if the buying side of the business becomes machine-based, how much of that will be managed by clients and how much will that change the agency business model?," asked an audience member, Pete Mitchell, global innovations director at Mondelez International. "The agency business model has evolved enormously over the last five years," Cooper answered. "We went down a bit of a dead end five years ago when it became all about saving the client money. That remains important, but it missed the best opportunity that the best ROIs are derived from being highly creative. In exposing that creative message in the most effective way. That's how our business is changing and needs to change going forward." In the 1990s, when he was running Initiative Media Worldwide, Kassan said, his biggest client (Disney) acquired ABC. "Now, 25% of Walt Disney's spend was in ABC, and we thought a quarter of our biggest client's money was going in-house," he said. "We nevertheless managed to convince them that they needed us to buy it from them for them because of the stewardship. That argument applies today. Agencies aren't just minders, finders and grinders. I think the agency life will have a longer set of legs than people expect."